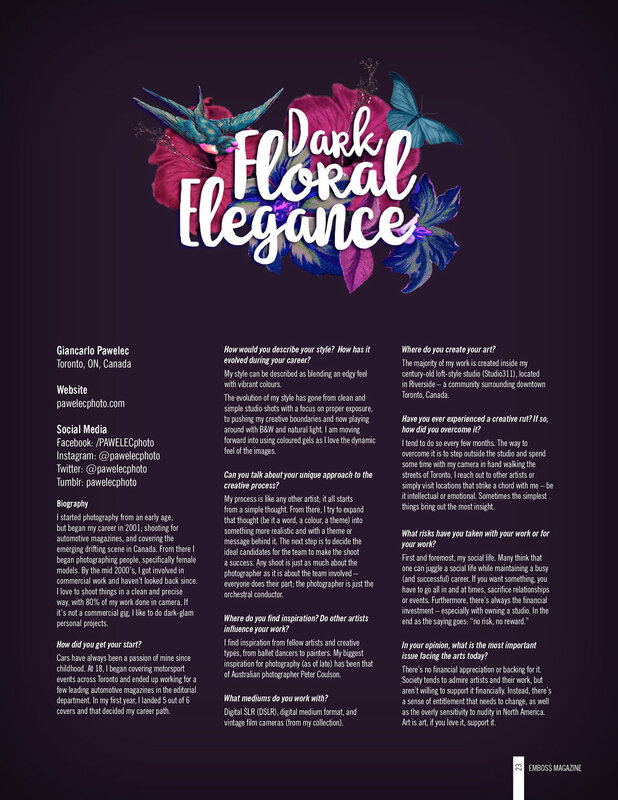 Within weeks, planning started with the concept "Dark Floral Elegance" created by Amanda. I scouted a few locations across Toronto and began testing various lighting setups to match the dark look and feel of mood board. Shortly after, we gathered a great team including hair stylist Caitlin Quelle, make-up artist Liliana Diamantopoulos, fashion designers Irina Shad and Mia Parese, and lastly the models Amanda Robyn, Masha Mez, and Beatrix. After months of waiting on its submission status, the fashion editorial was published in the January 2017 issue of Emboss Magazine. It's also worth mentioning that they did a little artist interview on me, so be sure to have a read and flip through the PDF tear sheets below! I would like to thank the entire team for their hard work and dedication with this shoot. It was a grueling 10+ hours both in Studio 311 and on location to make this editorial happen and I couldn't be happier with the results. Be sure to grab yourself a copy of Emboss Magazine (Issue 6) - in print and / or digital!